A lot of people love barbecues (I know I do, and I bet you do, too). There’s just something about grilled foods that’s so good. It also feels great to cook your own grilled dishes, that’s why owning a barbecue grill is very important in every household. 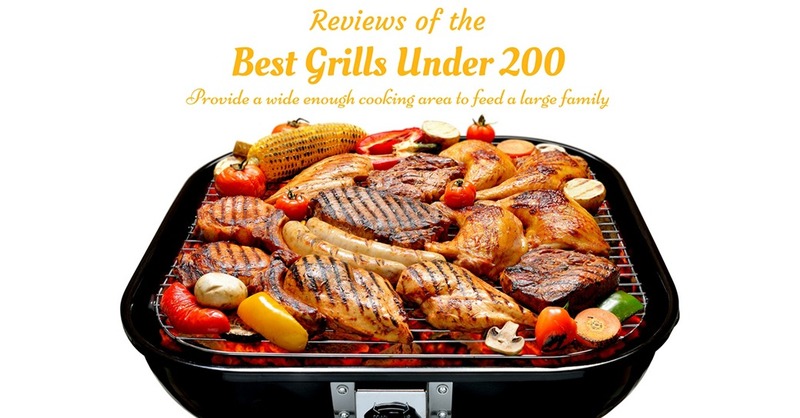 You don’t even have to pay a lot for a decent BBQ grill – and I will prove it to you by presenting you with 8 of the best grills under 200 in this post. There are 2 basic types of grills – grills that are for indoor use and those that are for outdoor use. Indoor grills are compact and smokeless since they will be used inside the house. Therefore, charcoal grills are not for indoor use. Your options for this type of grill would be gas or electric. 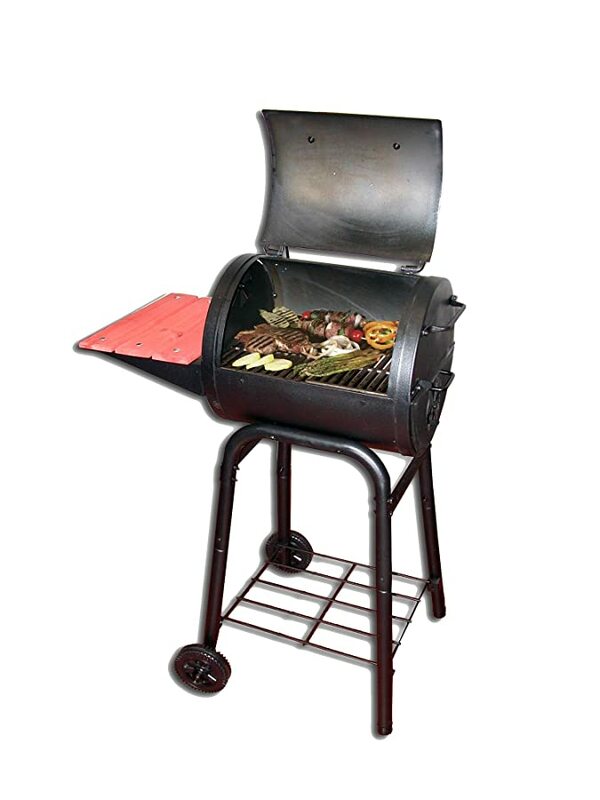 Outdoor grills come in different shapes and sizes. They can either be gas-powered or charcoal-operated. 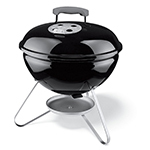 Since grills are very popular in outdoor adventures, a lot of models are made to be portable. When choosing a grill, you have 3 options to choose from – gas, charcoal or electric. Gas grills are powered either by natural gas or propane gas. Those that use natural gas need to be installed with a gas line to work. Models that are powered by propane gas, on the other hand, use gas cylinders. Portable grills usually run on 1-pound propane cylinders, but adapters can be used to connect them to a 20-pound propane tank. Electric grills need electrical supply to function. Needless to say, electric grills are for home use only. They can be directly plugged into a wall outlet when used in the kitchen. If you’re going to use one in the backyard, an extension cord may be needed. Charcoal grills function with the use of coals. This is the old-fashioned way of grilling, but today’s modern grills have made this task more enjoyable. Charcoal grills never lose their appeal because of the distinct taste in barbecues when grilled in this way. 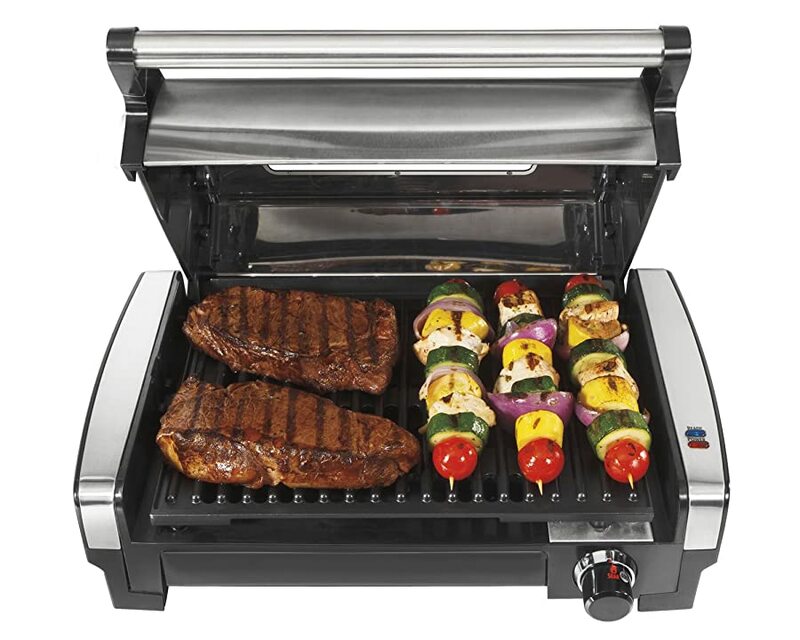 You can use it as a tabletop grill indoors (without the stand) or use the stand when you’re grilling outdoors. This model is available in silver and black (combination) color. 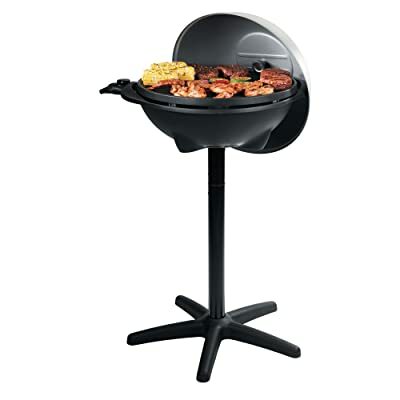 Pedestal Stand – The grill stands at 2 ½ feet high (without the lid). When you remove the stand, it becomes an independent tabletop grill. The lid is dome-shaped to effectively trap hot air inside the grilling chamber. It’s quite heavy for a portable grill. The cord is short, so you might need an extension cord. I like the multifunctional design of this grill. 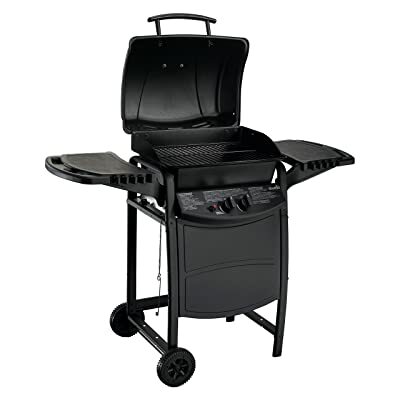 While you can use it outdoors because it comes with a stand, it can also be used as a countertop griller inside the house. It’s also smokeless since it won’t make use of charcoal. 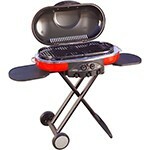 It’s a great grill for small families who want the flexibility of grilling indoors and outdoors. Cooking Surface – This round-shaped grill has a diameter of 14 ½ inches for its cooking surface. This space can hold 4 large steaks or 6 regular sized burgers. Cooking Grate – The cooking surface is triple nickel plated. Handle Design – The nylon handle is reinforced by the glass to make it stronger. It also stays cool even when the grill is being used. Height – Without the dome lid, the grill stands at 12 inches high. Ash Tray – There’s a removable ash tray for the charcoal dirt. The cooking grills are made of durable stainless steel materials. This is the type of grill that can serve the needs of a small group of people. It’s light and compact design makes it ideal for use in camping, cookouts, and other outdoor adventures. The Smoke Hollow 205 grill is a tabletop model that’s powered by propane gas. It’s only available in one color – stainless steel. Power – This model is powered by 12,000 BTU. The stainless steel, U-shaped burner enables it to spread heat evenly on the cooking surface. Cooking Surface – It has 305 square inches cooking area. This space can hold around 12 burgers. Portable Design – It has a locking hood, folding legs, and carrying handle for portability. Operation – This model is gas-powered, and it uses a small (1-pound) propane cylinder that can be used for a long time. It’s easy to transport because of its compact design. The warming rack can be removed for more space. It comes with push button ignition for easy operation. The hood is not tall enough to accommodate beer chicken recipes. There can be some flare ups during operation. 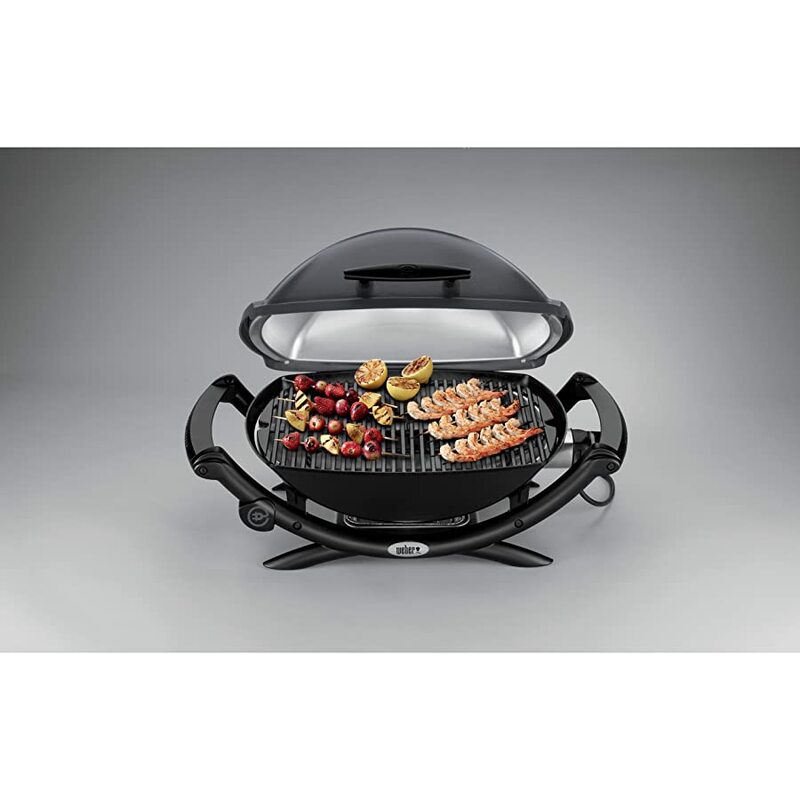 You can use this grill for your everyday grilling needs and for your outdoor adventures as well. You can position it in your backyard or patio or fold it up to bring it along with you on picnics. As the grill that landed on the Top 3 spot, I consider it to be the best gas grill under 100. The Coleman Road Trip grill is a portable/ collapsible model that’s powered by propane gas. You can choose from several colors when you decide to get this unit – black, red, blue, silver, maroon, green, orange, and purple. Power – It’s powered by 20,000 BTUs (10,000 BTUs on each of the 2 burners). Cooking Surface – You can grill on a cooking area of 285 square inches. It’s spacious enough to hold around 10 pieces of burgers. Interchangeable Cooktops – You can use the included grill or use stove grates or griddles that are compatible with the unit. Portable Design – This is a portable gas grill – the stand can be collapsed and folded. It comes with wheels and there’s a carrying handle as well. Side Tables – It comes with sliding side tables to hold your cooking accessories. It’s equipped with instant ignition for one-click operation. The cast iron and porcelain coated grills are easy to clean. It’s nice to look at. Using high setting on this grill can get so hot that the handle can melt – so, just use the medium setting when grilling food on this model (the low setting on the grill can actually get very hot, too). Built for outdoor use, a standard 1-pound propane cylinder will last for about an hour on full power (you don’t need to use it on full power, of course). You also have the option of using an adapter to connect it with a longer lasting 20-pound cylinder. 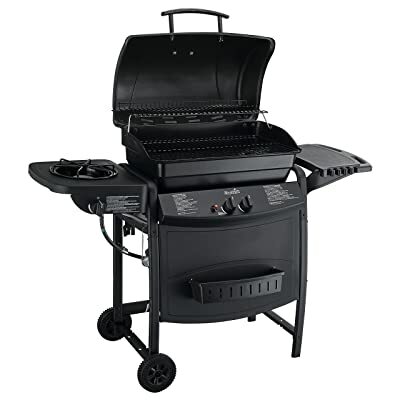 Considering its price and features, I believe it’s the best gas grill under 150. The Char-Broil Classic 280 is a small grill that’s powered by propane gas. It’s only available in the color black. Power – It comes with 2 burners that are powered by 26,000 BTUs. Cooking Surface – The cooking area measures 280 square inches and can hold about 10 burgers. Grates – The grilling grates are porcelain coated. Materials – The unit is made of aluminum materials. The steel lid is tough to withstand high heat. The grates are easy to clean. There are wheels to enable easy transportation of the unit. The side tables can’t be folded. The lid is not tall enough to cook beer can chicken. It takes some time to assemble (about an hour or so). Since the Char-Broil is a small type of grill, it can be easily accommodated in an apartment porch. You can also set it up in your backyard or bring it along with you to the beach. This can be the best gas grill under 150 for you. The Char-Broil Classic 360 is a full grill for outdoor use. It’s powered by propane gas and it’s available in the color black. Power – This model has 2 burners powered by 35,000 BTUs. It also has a side burner with 8,000 BTUs of power. Cooking Surface – The main cooking area measures 360 square inches (spacious enough to hold 10 burgers and 10 hot dogs) and the warming rack measures 170 square inches (it’s ideal for grilling fruits and vegetables). Side Shelf – The built-in side shelf provides additional working space and there are hooks to hold some of your cooking utensils. Lid – It comes with durable steel lid and firebox that can withstand constant exposure to heat. Materials – It’s made of steel materials. The grates are porcelain coated and easy to clean. The lid is too shallow to hold a rotisserie. The extra burner at the side can’t be folded out of the way. The side shelf can’t be folded even when it’s not needed. This is a big grill and it can take a while to assemble it (about 2 hours). Because of its spacious cooking area, it’s most suitable for big families. Since it’s big and heavy, it will probably be a mainstay in your backyard. Still, all things considered (especially the price), I believe this is the best gas grill under 200 in this Top 8 list. The Char-Griller 1515 is a portable charcoal grill. It’s available in black color. Height – It’s 44 inches high from the ground. Side Shelves – The built-in side shelf can hold your cooking tools or cooked food. Caster Wheels – Having a pair of the wheel makes it easy to move from one place to another. Construction – The main unit is made of steel, and the grates are made of cast iron materials. 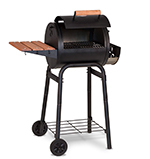 This cute and simple charcoal grill is great for small families who like cooking barbecues on their patio once in a while. You can cook steak, chicken, burgers, hot dogs, fruits, and vegetables with this grill and they will have that distinct charcoal taste like a real barbecue. The Char-Broil Quickset 3-Burner gas grill is a full outdoor grill that’s powered by propane gas. You can get it in only one color – black. Power – It has 3 burners that are powered by 36,000 BTUs. It also comes with a side burner powered by 12,000 BTUs. Cooking Surface – The primary cooking area measures 370 square inches (it can hold more than 15 burgers at a time). The secondary cooking area, on the other hand, has a cooking surface of 170 square inches. Side Shelf – It has a built-in side shelf that you can use as a workstation. Wheels – It comes with caster wheels for easy transportation. Temperature Gauge – A built-in temperature gauge allows you to monitor the temperature setting inside the grilling chamber. There’s a side burner that you can use for your other cooking needs. 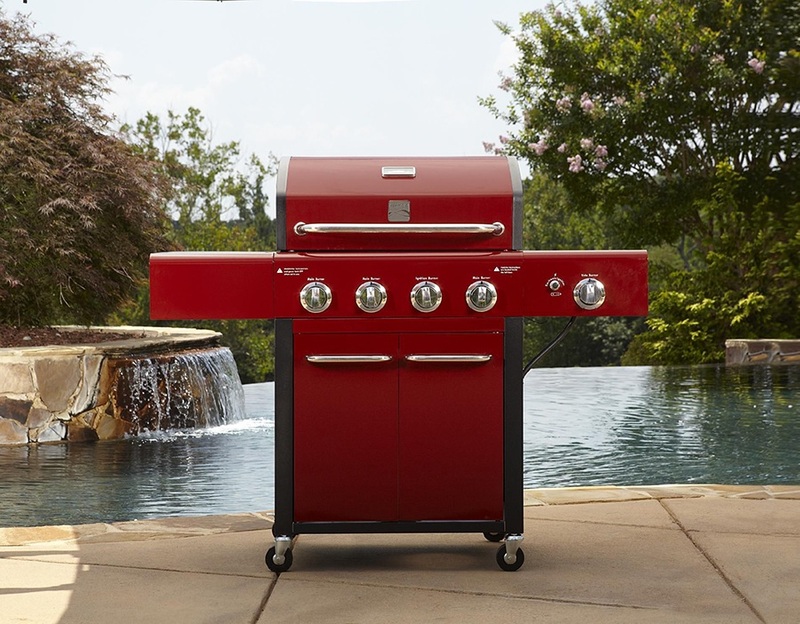 The push button ignition control makes it easy to start the grill. All the burners have independent controls. You have just been presented with 8 models of the best grills under 200. If you still need help in making your final decision, I would be happy to make a few suggestions. If you’re looking for an electric model of a grill, I highly recommend the George Foreman GGR50B Grill. 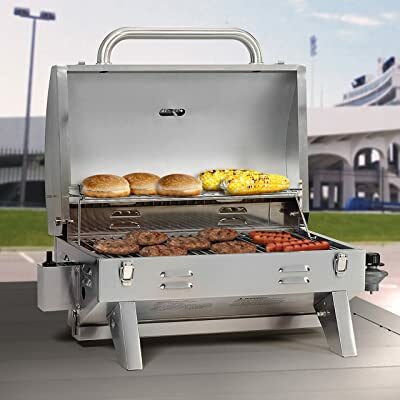 It’s an indoor/ outdoor grill, and you have the option of using it with the included stand or without it (then it becomes a tabletop model). Now, if you’re particularly into charcoal grills, you can choose between the Weber 10020 and the Coleman Road Trip grills. These are both portable grills – so, you can use them in your backyard or bring them along with you during outdoor activities (camping, tailgating, etc.). 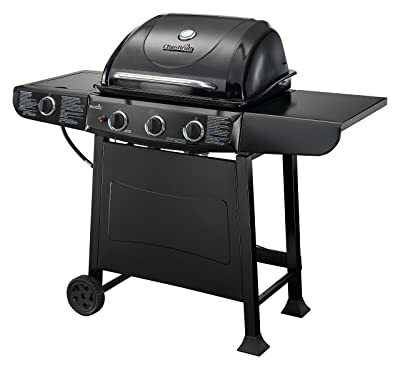 If size is important to you and you want a small grill that’s powered by propane gas, the Char-Broil Classic 280 2-Burner Gas Grill makes for a fine choice. You will find that it’s very easy to manage. My last suggestion is a large, powerful grill that can be a mainstay in your backyard – the Char-Broil Quickset 3-Burner Gas Grill. It’s really for people who love barbecues. I hope this review post has proven to be informative to you and that my suggestions have helped you decide in choosing the best grill for your needs. If you have concerns, questions, anything – just leave your message in the comment section below. Don’t forget to share this article with other barbecue lovers – especially those who are looking for the best grills under 200.